The last sewing machine in Dumbo, or at least one of the remaining few can be found in Mark Burnett’s studio in 68 Jay Street. 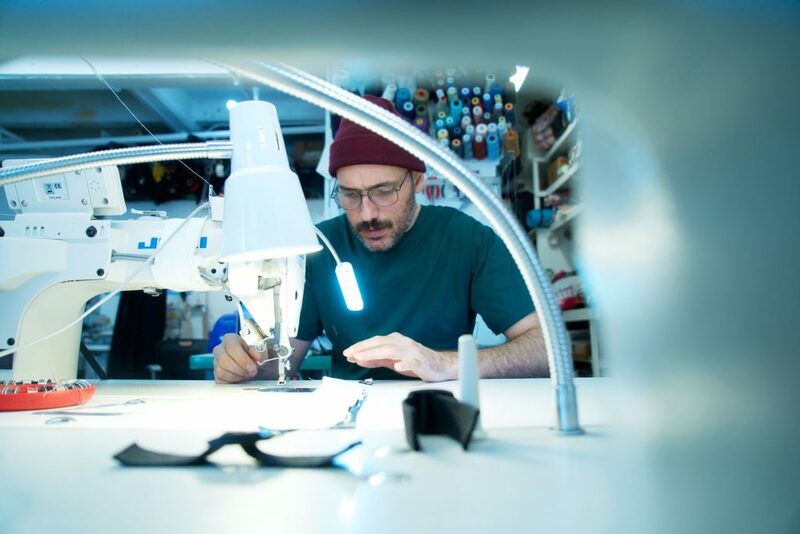 The combination of analogue machinery, cutting tables, paper patterns, and colorful spools of thread nostalgically reminds one of Dumbo in the nineties, when artists and designers ruled the hood. In 1996, the strikingly handsome Burnett created a young women’s fashion line, Princess Highway, in his native Melbourne, Australia, He sold the business in 2004 but stayed on to design for the company until 2008. In 2008 he moved to New York to start a new fashion adventure. “It took me at least one full year to acclimate myself to New York. Getting used to the cold weather was one of the hardest obstacles for me to overcome. Bundling up with layer upon layer, and temperatures below freezing were sometimes too much for me to bear. I also arrived just at the financial crash hit and by the time I exchanged my Australian money for American dollars it had lost half its value. That was tough”. Ten years later as a seasoned New Yorker one can now witness Burnett riding his bicycle under the BQE Brooklyn in the dead of winter with a sewing machine strapped to the back of his bike. Unfortunately, last December he was recently hit by a car door while riding home and broke his hip. After a few weeks of rest and relaxation back home in Australia he is back in Dumbo doing what he does best. Last year Mark was commissioned to bustle a wedding dress for a couple’s gravity free ceremony. 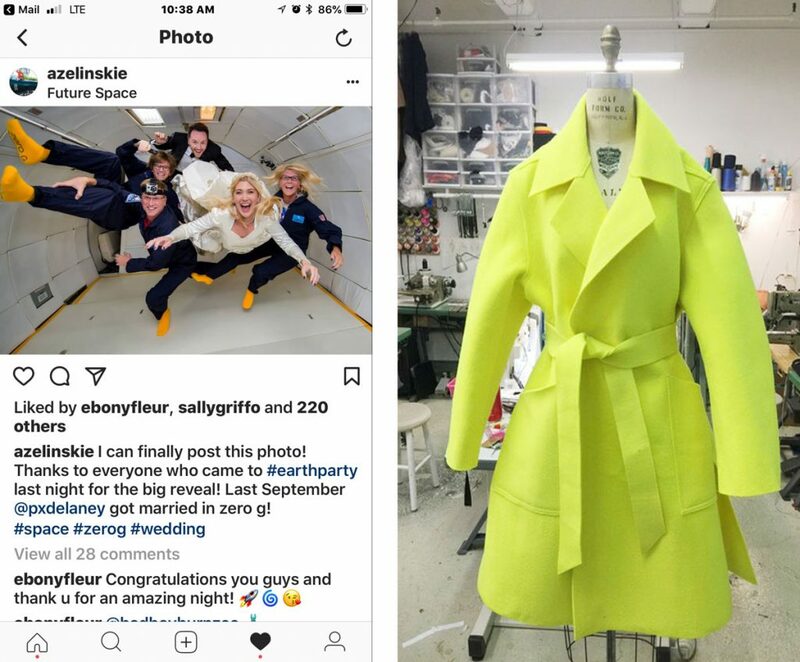 The bride and groom commissioned an aeronautics company to fly a plane 34,000 feet above the earth in order to get married in weightlessness. The puffy princess gown, worn by the bride, could have presented a dangerous situation if not strapped and bustled! After designing new collections both in New York and London, Burnett decided to steer his career in a new direction. 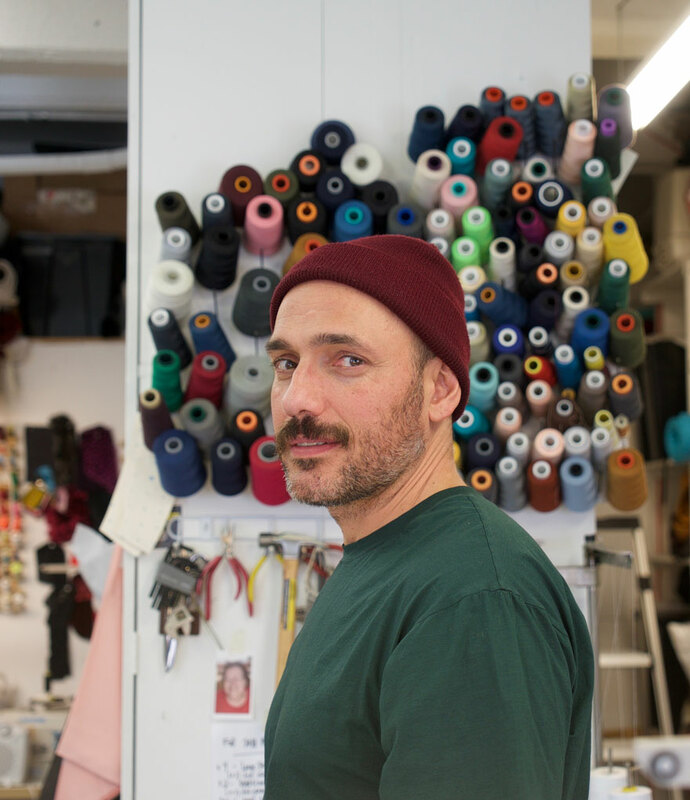 Instead of designing his own line of women’s wear, he decided on servicing other fashion houses with his expertise in samplemaking, patternmaking and on set tailoring. Working to capacity, Mark recently partnered up with his friend and colleague of 25 years, ChaCha. ChaCha also a master seamstress and designer has tailored suits and shirts for Jerry Seinfeld as well as creating custom jackets for the iconic jean company Wrangler. When asked about his most unusual project, he doesn’t miss a beat. Last year he was commissioned to bustle a wedding dress for a couple’s gravity free ceremony. The bride and groom commissioned an aeronautics company to fly a plane 34,000 feet above the earth in order to get married in weightlessness. The puffy princess gown, worn by the bride, could have presented a dangerous situation if not strapped and bustled. Weightless conditions could cause the dress to twist and turn and rise above the bride’s head, which is something any self respecting couple would want to avoid.